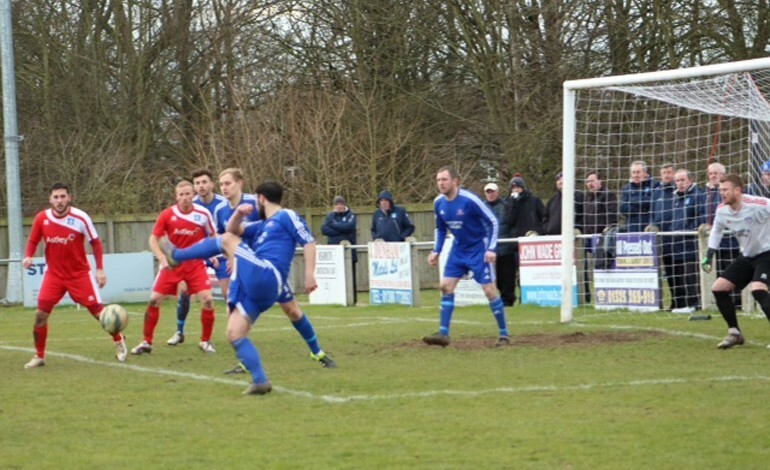 Newton Aycliffe regained third place in the Northern League with an impressive 4-0 win over 2012 FA Vase champions Dunston UTS on Saturday. A hat-trick from Matty Moffat sealed the win, Aycliffe’s fifth in the last six games. Two goals in the first half from Moffat proved decisive with the Dunston defence unable to cope with the Aycliffe centre forward. The home side pressed from the start with Ashley Coffey playing a fine ball through after just six minutes but finding Moffat just offside. Coffey came close himself ten minutes later. Stuart Banks threaded his way into the box but Coffey couldn’t direct his powerful cross onto the goal. The first goal came after 22 minutes. A misdirected header from a Dunston defender fell to Moffat who rounded keeper Andrew Clark and scored from a very tight angle. Moffat got his second with five minutes remaining before half-time. Controlling the ball inside the penalty area he again beat the keeper and carefully placed the ball between two defenders on the goal line. Aycliffe continued the form into the second half with the pressure paying off as the hour approached. A handball in the penalty area had the referee pointing to the spot and Moffat completing his hat-trick. The last goal of the game came on 65 minutes when Dennis Knight took a free-kick from the right wing. His long ball in found Coffey whose header beat the keeper. It might have been five with five minutes to go when substitute Jordan Laidler’s long ball forward was headed down by Banks but the keeper got his foot to it. The final whistle brought another valuable three points to Aycliffe with keeper James Winter rarely troubled. The hat-trick brought Moffat’s goal tally to 18 in all competitions this season. Aycliffe’s next home game is against Whitley Bay on Tuesday 8th March. Kick-off at Moore Lane is 7.45pm, with admission £6 adults, £4 concessions and Under-12s free with an adult.